DETROIT, Michigan, September 8, 2014 (ENS) – General Motors’ luxury auto brand Cadillac will offer advanced “intelligent and connected” wireless vehicle technologies on several 2017 model year vehicles, GM chief executive Mary Barra said Sunday during her keynote address at the opening of the week-long Intelligent Transport Systems (ITS) World Congress at Detroit’s Cobo Center. Barra and U.S. Transportation Secretary Anthony Foxx opened the 21st ITS World Congress, which attracted thousands of transportation officials, policymakers, business leaders and high-tech innovators from across the United States and 65 countries interested in the latest developments in intelligent transportation systems. 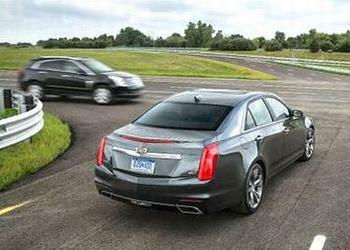 Barra said the 2017 Cadillac will feature an advanced driver assist technology called Super Cruise, and the 2017 Cadillac CTS will have vehicle-to-vehicle (V2V) communication technology to help them avoid collisions automatically. Super Cruise, the working name for GM’s automated driving technology, will offer hands-off lane following, braking and speed control in bumper-to-bumper traffic and also on long road trips. V2V communication technology could mitigate many traffic collisions and improve traffic congestion by sending and receiving basic safety information such as location, speed and direction of travel between vehicles that are approaching each other. It can supplement safety features, such as forward collision warning, already available on many cars. As the world becomes more congested and new populations need access to personal mobility, accidents continue to be a global concern. A recent U.S. National Highway Traffic Safety Administration (NHTSA) study estimated that the economic and societal impact of motor vehicle crashes in the United States is more than $870 billion per year. In August, the NHTSA announced that it plans to draft federal regulations for vehicle-to-vehicle technology. The agency estimates that the systems could add about $300 to the cost of a car. Addressing the ITS opening night crowd, U.S. Transportation Secretary Anthony Foxx called on Congress to pass a transportation bill that will help intelligent transport technology achieve its potential. Last-minute passage of a federal authorization and funding patch at the end of July provides surface transportation funding through May 2015, diverting a Highway Trust Fund default that would have crippled the infrastructure industry in the heart of construction season. But Secretary Foxx says Congress needs to do much more. Regardless, Foxx promised that the Obama administration would help automakers bring their advanced technologies to market. GM, Ford, the Michigan Department of Transportation and the University of Michigan have formed a partnership to re-engineer more than 120 miles of roadways in the metropolitan Detroit area to make it ready for V2V technology. Also on Sunday, a High Level Policy Roundtable brought together transportation officials from 14 states to share their thoughts, ideas and plans for making use of ITS-enabled solutions in view of current technologies and economic conditions. The Roundtable’s keynote speaker was Robert Slimp, chief executive of HNTB Infrastructure, who said modern connectivity options provide a new paradigm for transportation planners as well as the people who use U.S. roads and rails. “Ultimately, people are going to interact with our transportation networks in a whole new way,” he said. The survey found that many Americans would be willing to part with more cash to implement a connected vehicle system, which would allow travelers to be notified about road conditions and potential dangers electronically in real-time.